I'll get something out the way first... This involves a building. I know, I know, I hate them too but if it's a building for a reason not just a building for the sake of it, I can live with it... and hopefully this idea is something folks might like. I'm suggesting building an Arborist's Workshop, a tree surgeon. We know that Pioneer times had arborists, after all we've already met Johnny Appleseed in the Frontier Heroes missions, so why not give one a home on your frontier and get some advantages from it? This is my thinking of it, I'd be interested in other folks impressions. Once the Arborist's Workshop is completed and a certain amount of missions finished the workshop begins to work for lumber trees the same as the Irrigation Station does for crops. The skill of the Arborist allows the lumber trees on your homestead to grow 20% faster, bringing them up to full size quicker. 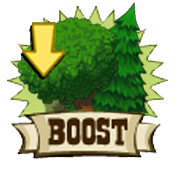 The Workshop also has a daily bonus that drops Spring Water to use on the limited edition trees AND can, on occasion, drop a new "Lumber Boost" that can be used to instantly boost any lumber tree up a stage in it's development. Finally, the Workshop has it's own collection that can be traded in for a FULLY GROWN lumber tree, Oak or Pine. They can make it rare, they can make it ungiftable just to crack down on exploits, but just a collection that'll help out when we really, REALLY need a tree! I think with the chance of fully grown trees, quicker growing trees, lumber boosts AND spring water... if it's a nice small footprint (little wooden shed?) I wonder if folks would be happy to build it? I'd be very interested in your thoughts here or on our Facebook Page. That is a fantastic Idea Andy. Awesome! Am hopeful it is developed - cute graphic btw. I like it. I hope you can convince them to do it. I think it would be great to have. Really good idea, a building with a purpose would be a novelty. Great idea Andy- have you put it to the Zynga Gods? I sent them a suggestion today. I suggested that we be able to exchange excess coins in the bank for horsehoes. I suggested 500,000 coins gives you 25 horseshoes. I would be happy with that. Great Idea. I would love that building! Please convince them to make it! yes this is an excellent idea since the higher up you get the less trees you have because you had to remove the trees to make room for all the other buildings you have to do for missions!!! !hope they go for it!!! sounds good to me, also like the idea of exchanging coins for horseshoes. Just one question, as you understand our liking of the game so much and also our fustration, WHY are u not working for zygna, they certainly need someone with such good ideas!!!! like the idea but instead of having another building why not upgrade the sawmill for it? I like this idea but upgrading the saw mill is a good idea too. I go with the upgrade idea. The workshop we have could be upgraded to include this or the sawmill. Otherwise, I like the idea. good idea we need something like that to make the tree's grow faster for some of the missions that calls for tree's!!!!!!!! I love the idea but it would be better as others suggested to upgrade the saw mill. Would love it - trees take way too much to grow and it becomes annoying. It's a great idea! I wonder why you don't work for Zynga -'cos they need a few brains - then they wouldn't put up missions where you have to ask for hundreds of spring waters. I'm not getting these missions that trail on forever. You think they'd have learnt something from Holiday Hollow - which I'm sure millions gave up on. The constant begging is soooo wearing. great idea. Let's get er done. I like this idea...so many missions call for chopping of many trees and they do take a long while to grow and i sure as heck am not one to spend horseshoes on trees...great idea, Andy! Upgrading the sawmill could work as well if it included your ideas. I hope Jack at Frontierville likes your idea...make it a cause and I will definitely support you! Finally...and thanks...it takes so long to grow trees and this would really help! BRILLIANT suggestions, Andy!! Love, love, love them! I think Zynga should offer you a high-paying job! You would be a huge asset to them! Really appreciate you and the other Frontierville Express admins! You all really help others' game play! Thanks for all you do!!! j'aimerais ça serai plus simple et efficace !!!! i think this is a good idea! i could always seem to use more trees!!!!!! 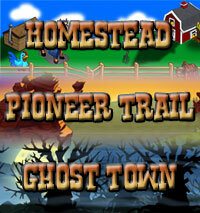 good idea but the homestead is getting smaller with all the buildings and nowhere to put them. I think it is a good idea!! A building that provides worthwhile use is not a nuisance. I would really like to see this idea come to life. I have room for this kind of building, more than decorations we keep getting for rewards. This is such a great idea!! It's useful, it would generate revenue (buying an item to complete the workshop). It would also inject some life into the game. Definitely submit it! 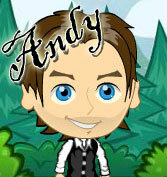 Love the idea Andy .. what about using the tree house that many of us received when we started playing? Great idea! I have also suggested to Zynga (over and over) that instead of trading things at Barts Post, I'd rather send them to friends as gifts. dont want it for a few months yet, im still struggling with the 39 missions on the go now, yes 39 all at once, the fun is dissapearing fast. I think its a great idea, but like the last person said, it can wait a bit tho lol, zynga should employ you ! I would build it...... :O)) Let us upgrade one house we already have.